I have seen clever, thoughtful and hardworking people trying to be right about the CSS is not broken and CSS is broken. PopCorn. I will not attempt to be right on anything in this post. I'm just sharing a feeling. Let me steal the image from this provocative tweet/thread. You can also read the thread in these tweets. I guess looking at the image I understood how/why the discussions would never have any resolutions. Just let clarify a few things. CSS means Cascading Style Sheets. Cascading Style Sheets (CSS) is a simple mechanism for adding style (e.g., fonts, colors, spacing) to Web documents. . Words have meanings. It is 20 years old spec wise. But the idea came from a proposal on www-talk on October 10, 1994. 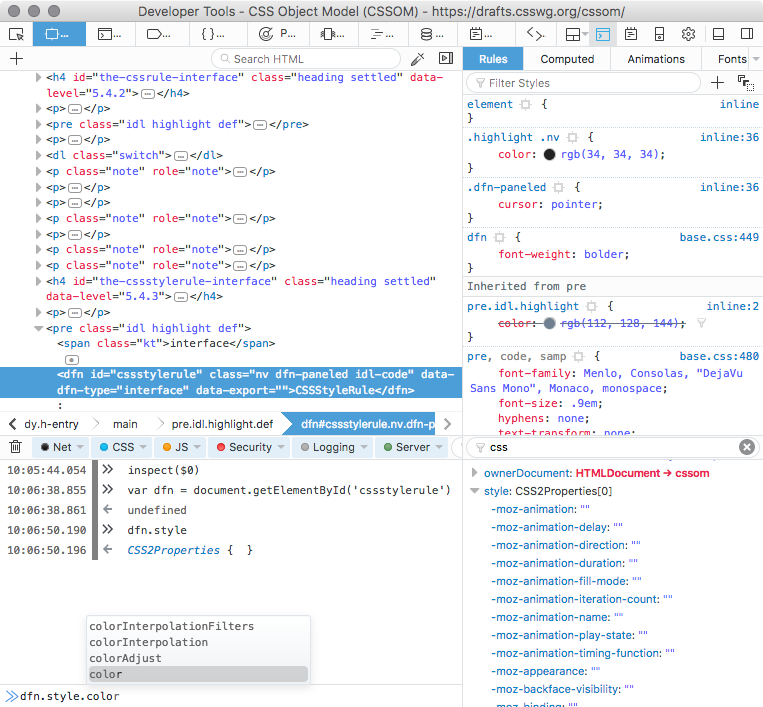 Fast forward, there is an ongoing effort to formalize CSS Object Model aka CSSOM defines APIs (including generic parsing and serialization rules) for Media Queries, Selectors, and of course CSS itself. Let's look at the very recent CSS Grid, currently in Candidate Recommendation phase and starting to be well deployed in browsers. Look carefully at the prose. The word DOM is cited only twice in an example. CSS is a language for describing styling rules. What people are argueing about and not discussing or dialoguing about is not about CSS, but how to apply the style rules to a document. Some developers prefers to use style elements and files using the properties of the cascade and specificity (which are useful), aka CSS. There is one thing which rubs me in the wrong direction is when people talk about HTML and CSS with the "in JS" term associated. When we manipulate the DOM, create new nodes and associate style to it, we are not doing anymore HTML and CSS. We are basically modifying the DOM, which is a complete different layer. It's easy to see how the concerns are different. When we open a web site made with React for example, the HTML semantics is often gone. You could use only div and span and it would be exactly the same. You could use only div and span and it would be exactly the same. pronoun verb verb adverb noun conjunction noun conjunction pronoun verb verb adverb determiner noun. I also would be curious for the advocates of applying styles to nodes in the DOM, if they made the experiment of generating (programmatically) a hierachical CSS from the DOM. Basically the salmon ladder in the river to go back to the source. I'm not talking about creating a snapshot with plenty of style attributes, but reverse engineering the cascade. At least just as an experiment to understand the two paths and what we could learn about it. 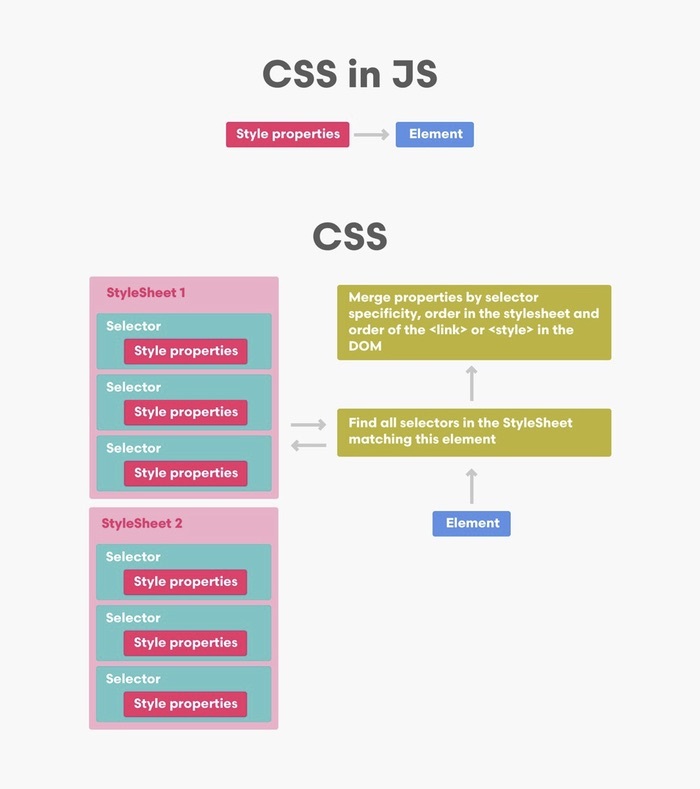 It would minimize the CSS selectors, take advantage of the cascade, avoid as much as possible !important, etc.